The architecural firm is honored to participate in three groundbreaking exhibitions presented in partnership with the Chicago Architecture Biennial. Completion of building renewal by HBRA Architects, Chicago. 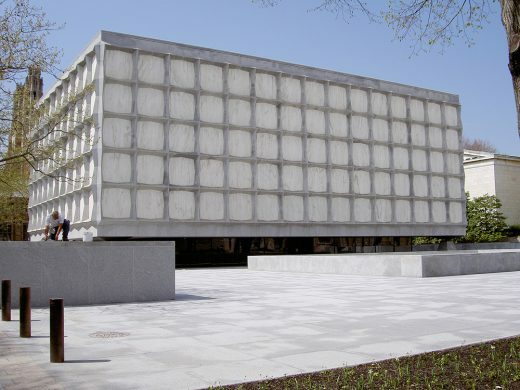 The Beinecke Rare Book & Manuscript Library at Yale University, designed by Gordon Bunshaft of Skidmore, Owings & Merrill in 1963 is a Modernist masterpiece, reports the Architectural Record. The iconic building closed for a major renovation in May 2015. The renovation replaced the mechanical systems partly to fix condensation problems. The renocation also allowed expandsion of its research, teaching, storage, and exhibition capabilities. The building reopened on September 6. 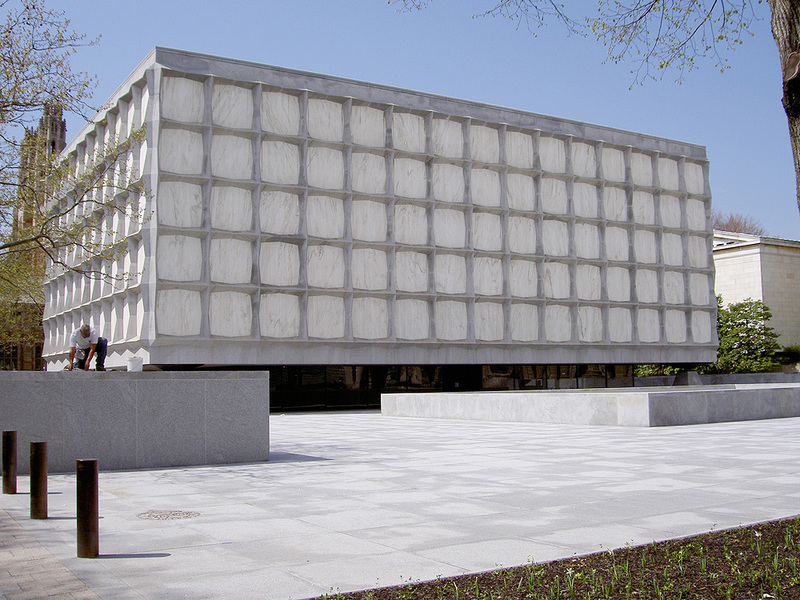 This archive of the Yale University Library in New Haven, Connecticut is located on Yale University’s Hewitt Quadrangle. Its rectangular volume is enclosed in sheets of marble, thin enough (at 13∕8″) to transmit light. That means the interior of the building glows by day. But it also posed “a major challenge,” says Bill Mahalko, who, as project architect for Chicago’s HBRA Architects, oversaw a 16-month, $70 million renovation of the building. New Haven’s Newman Architects was architect of record. “The thermal qualities of the marble are similar to those of single-pane glass,” says Mahalko. “It’s not a good insulator.” In cold weather, condensation formed inside the building, which houses some of the world’s most precious volumes—including a Gutenberg Bible. 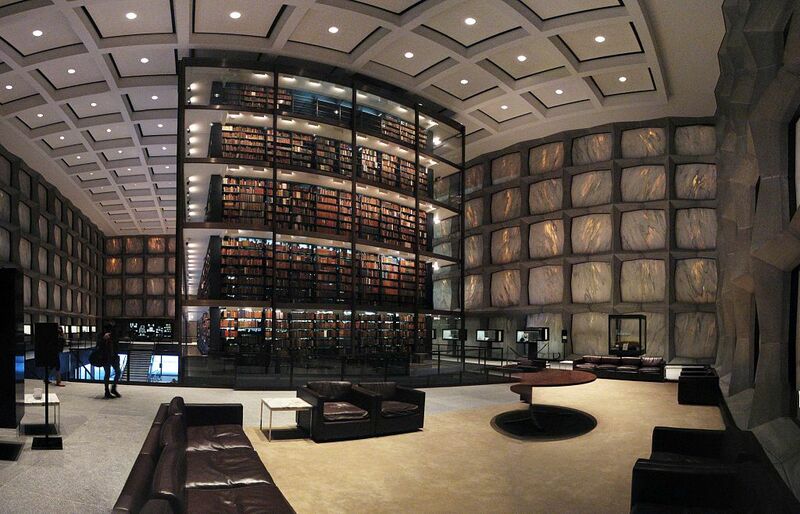 Beinecke Rare Book & Manuscript Library at Yale University by SOM – article in the the Architectural Record. The Chicago office of Skidmore, Owings & Merrill LLP (SOM), with its culture of inter-practice innovation, design excellence and commitment to the city where the firm was founded, has earned the 2011 Firm of the Year Award from the American Institute of Architects’ (AIA) Chicago chapter. The award is the organization’s highest honor a firm can receive. It recognizes outstanding achievements by a firm, excellence in the body of work produced by the firm, and the contribution made by the firm to the advancement of the architectural profession in the areas of design, research, planning, technology and architectural practice. SOM Chicago will celebrate this honor with members of the design community at the AIA Chicago annual meeting and awards presentation on Friday, December 9, 2011 held at ReBuilding Exchange in Chicago. Founded in 1869, AIA Chicago represents over 3,000 licensed architects, architectural interns and allied professionals in northeastern Illinois. AIA Chicago is the second largest AIA chapter in the nation. December 2, 2011 – Chicago, IL – Skidmore, Owings & Merrill LLP (SOM) congratulates Ms. Nada Andric, Associate Director and Chicago office interior design studio head, on being inducted into Interior Design magazine’s illustrious Hall of Fame The Hall of Fame was established by the magazine in 1985 to recognize individuals who have made significant contributions to the growth and prominence of the design industry. Previous Hall of Fame luminaries include Antonio Citterio, Clodagh, Thiery W. Despont, Frank Gehry, Albert Hadley, Andre Putman, David Rockwell, Lauren Rottet, Philippe Starck, Robert A.M. Stern and SOM Interior Design Partner, Stephen Apking. In addition to Andric, Patricia Urquiola, David Keinberg and George Beylerian will also be inducted into the class of 2011. “It is truly an honor to be a 2011 inductee into Interior Design’s Hall of Fame and to be joining an elite group of professionals. My work is a passion of mine so to be recognized by my colleagues and collaborators with such a high honor is simply astonishing,” Andric said upon receiving her award at the Hall of Fame event at the Waldorf-Astoria in New York City. Since joining SOM in 1992, Andric has focused her extensive design experience on large-scale global architecture and interior design projects that have afforded her the opportunity to work in 13 countries. Her work can be seen in some of the world’s most iconic buildings including Burj Khalifa, the world’s tallest building in Dubai, and Jin Mao Tower in Shanghai, China, which upon its completion was China’s tallest building. Nada’s body of work also includes Virginia Beach Convention Center (Virginia Beach, USA), Korea World Trade Center Expansion (Seoul, South Korea), Hyatt Global Headquarters (Chicago, USA), Nestlé Makati Administrative Offices (Manila, Philippians), Xerox Center (Chicago, USA) and The Broadgate Tower (London, UK). Chicago, IL – The Skidmore, Owings & Merrill (SOM) Foundation announced today that the $10,000 SOM 2011 Structural Engineering Travel Fellowship has been awarded to Ashley Thrall, who will receive her PhD this month from the Department of Civil and Environmental Engineering at Princeton University, where she has also received an Master in Arts in 2009 and a Master of Science in Engineering in 2008. Working with Professors Sigrid Adriaenssens, Maria Garlock, and David Billington, her PhD research has focused on improving the sustainability of movable bridges by generating new forms that integrate the structural and mechanical systems. Based on her essay submitted for fellowship consideration, “Deployable Structures: Elegant Kinematics for Social Responsibility,” Ashley will utilize her fellowship to continue her interest in kinematic structures by studying the application of deployable structures for disaster relief. Her itinerary will include 1) visiting the site of a recent disaster; 2) meeting designers at research centers and design firms, and 3) evaluating deployable structures through site visits. Ashley will begin her itinerary in Haiti, at the site of the recent earthquake, and then will proceed to study deployable structures in the United States and throughout Europe. Having grown up in Canton, Connecticut and graduating from Canton High School in 2000, Ashley then earned her Bachelor of Arts in Physics from Vassar College. While studying physics, she utilized her summers to gain research experience at Vassar College, NASA’s Goddard Space Flight Center, the University of California – San Diego, CERN (European Center for Nuclear Research) and the University of Michigan. She was eventually drawn to structural engineering while seeking a field which blended her passion for design with her technical interests. The SOM Structural Engineering Travel Fellowship is awarded annually through a national competition. In January 2011, the SOM Foundation received portfolio submissions from students at US schools having an accredited program in civil and structural engineering. The submissions were judged on the quality of the design portfolios, research proposals and travel itineraries. Meeting in Chicago this year, the jury was comprised of some of the city’s most distinguished professionals: John Carrato, SE, PE, President and CEO, Alfred Benesch & Company; Inigo Manglano-Ovalle, Artist; Lawrence Novak, SE, PE, Portland Cement Association, Director of Building Structures; and Mark Schendel, AIA, Principal, Studio Gang Architects. The jury was chaired by SOM Structural Engineering Partner, Bill Baker. Now in its 30th, the Foundation’s fellowships continue to offer recent graduates the rare opportunity to travel in conjunction with carrying out in-depth research, collaborating with other professionals, and pursuing independent study outside the realm of established patterns. To date, the Foundation has awarded more than $1,000,000 to architecture, design, and engineering students who have gone on to distinguish themselves in professional and academic careers. November 19, 2010 (San Francisco, California) – The Partners and Directors of the San Francisco office of Skidmore, Owings & Merrill LLP (SOM) are pleased to announce that the office was honored with five awards from the American Institute of Architects California Council (AIA-CC) at the 2010 Awards and Installation Celebration held at the Solage Resort in Calistoga, California. Three projects received merit awards for design, the Structural Engineering Studio earned an achievement award for research and technology, and the 2011 firm award was bestowed on the San Francisco office. In the past two years, SOM’s San Francisco office has achieved a record-breaking number of accolades – nearly 90 awards for design and innovation. The new US Embassy in Beijing responds to its diplomatic role as a secure space that is both welcoming respectful of local traditions. AIA-CC praised the project as it “reflects American cultural, social, and political values while respecting China’s ancient and extraordinary vibrant culture.” Simple architectural geometrics, coupled with gardens and courtyards, symbolically fuse eastern and western traditions. AIA-CC hailed the Parkmerced Vision Plan as “a pioneering neighborhood revitalization effort.” The program transforms a 1950’s era, car-centric neighborhood into a holistic urban ecology through a comprehensive and innovative long-term development program based on the best-applied principles of environmental sustainability and neighborhood livability. The project promotes these principles by creating a pedestrian-friendly neighborhood that establishes a productive network of open space, applies evolving environmental technologies to reduce energy and water usage, and resolves automobile dependency by realigning public transit. Tianjin has long been one of Asia’s leading trading cities with a financial heart running along Liberation Road. City officials adopted a plan to transform this deteriorating, yet historic, neighborhood into a modern 133-hectare Financial Street. SOM worked with city officials to develop an ancillary program for Tianjin Financial City to bring this new vision to life, proposing a rich mix of commercial, residential and recreational uses to create a vibrant mixed-use district. Through the integration of historic revitalization, compact density, riverfront access, and environmental sustainability, Liberation Road will become a unique and livable place among the high-rise sprawl found throughout Tianjin. Former SOM partner passed away in his home at Martin County, Florida, USA.